This week kicks off a special presidential edition of Talance’s Friendly Web Tools Blog, celebrating the first time in eight years that the White House has participated in the technological revolution that’s been exploding everywhere else on the planet. We love how the President-elect has used technology to reach so many people, raise so many funds and create a powerful, galvanizing campaign. They’re all techniques that people at nonprofits should be studying and copying whenever possible – no matter who you voted for. 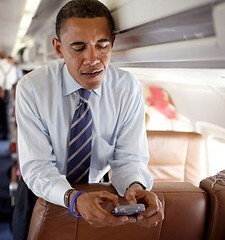 He’s a BlackBerry addict - did you see him giving speeches with it clipped to his belt? He plans to have a laptop on his desk in the Oval Office. This makes him the first president to have Internet access in the famous room. Sadly, however, he may have to give up e-mail, because they can be hacked into and subpoenaed.